Have you ever found a recipe on the internet or on the back of the box that just looked amazing? And you knew you had to make it? I happened to find this one on the back of the Nabisco Honey Maid crackers (graham crackers). But I tell you this, the picture on that box is NOT what I made. I only had vanilla pudding in my cabinet but that still shouldn’t have made a difference. The difference HAD to of been that what I was seeing on the back of that box was made with more pudding than what they say they used. No other way it could look the way it did. Pudding doesn’t rise and fall or flop!!! Here’s a picture of the back of the box (I added cool whip to the top of mine because it already took on a look of it’s own so I figured I’d just run with an addition!). Ok so can you clearly see the difference? This could have been made in a smaller pan possibly to get the same outcome. But I followed the exact directions with the exception of the flavors of pudding! There was a first in all of this. That is that Khali got to lick the “spoon”!! She didn’t care what the back of that box looked like. She wanted to eat that pudding and clean that off as best as she could!!! We’ve finished almost half of the pan. It tastes pretty good. Doesn’t look the same, but it tastes pretty good!!! Line 13×9-inch pan with foil, with ends of foil extending over sides. Beat vanilla pudding mix and 1-1/2 cups milk in medium bowl with whisk 2 min. Stir in 1 cup whipped topping. Repeat in separate bowl with chocolate pudding mix, remaining milk and remaining whipped topping. Break 1 graham square in half; coarsely crush 7 of the remaining graham squares. Arrange 14 graham squares and 1 graham rectangle on bottom of prepared pan; cover with vanilla pudding, remaining graham pieces and chocolate pudding. Refrigerate 4 hours. When ready to serve, use foil handles to lift dessert from pan; top with bananas and crushed grahams. Have a great week. If anyone happens to make this and it looks like picture on the box, please show me!! Please!! I baked for my first time this year. I think it was my first time. I’ve made banana bread many times. Many times I’ve messed it up. Not sure how, but I’ve found a way to destroy something so easy. I got some bananas at the store this past weekend because I asked what kind of fruit to buy. 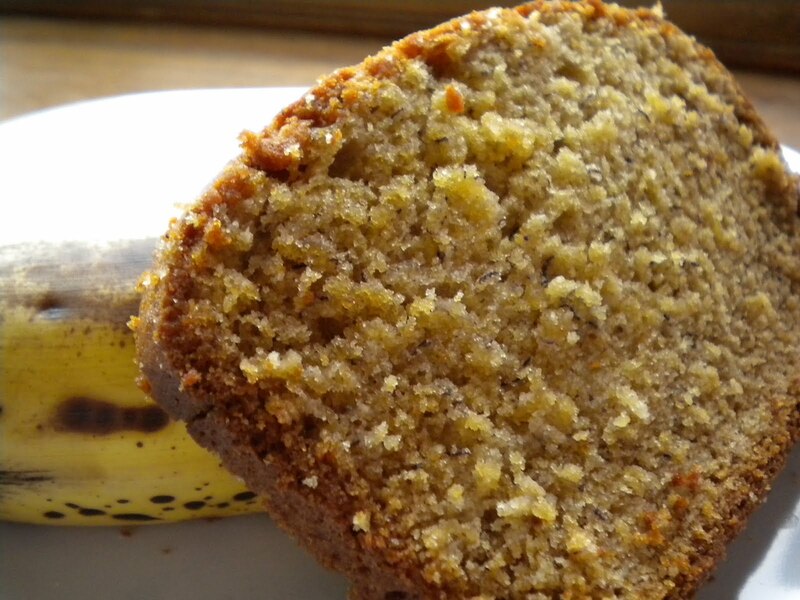 Bananas was the first thing…with the you can make banana bread with them. And because I didn’t want to disappoint, here I am posting the recipe! 1 Mix dry ingredients in a mixing bowl. 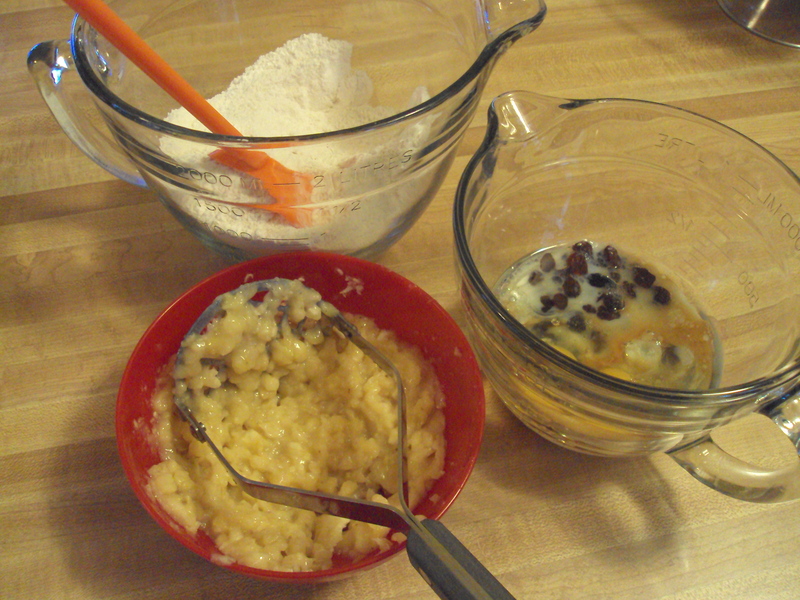 2 Mix wet ingredients in another bowl. 3 Combine wet and dry ingredients. 4 Pour in loaf pan sprayed with Pam and sprinkle with 2 tablespoons sugar. 5 Bake at 350 for about an hour, until golden brown. 6 Cool completely before slicing. I added some cinnamon to the dry mixture – about 1/2 teaspoon. Then I greased the loaf pan and sprinkled cinnamon and sugar combined around the entire pan. 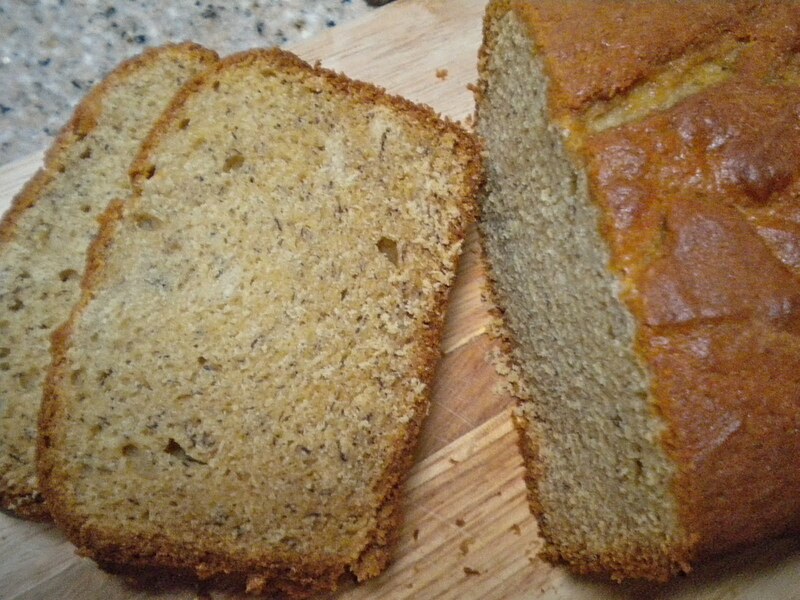 Once I poured the banana bread mixture in the pan, I sprinkled a bit more of the sugar/cinnamon mixture on top. I sure hope that was okay to do.. We shall see! Happy Baking. Have a good rest of the week. With only two of us in the house, I often end up with an extra banana or two that just didn’t get eaten before it got overripe. So rather than make the same banana bread over and over I try to do something different with them each time. Last week I chose these Strawberry Banana muffins from Joy of Baking since I needed to use up some strawberries too. These tasted just like banana bread, but with chunks of strawberries. I really enjoyed having one for breakfast each morning in place of my usual english muffin. Preheat oven to 350 degrees F. Position rack in center of oven. Line a 12 cup muffin pan with paper liners or grease with butter or a vegetable spray. In a medium sized bowl whisk together the brown sugar, eggs, vanilla extract and mashed banana. Add the melted butter to the brown sugar mixture and stir to combine. 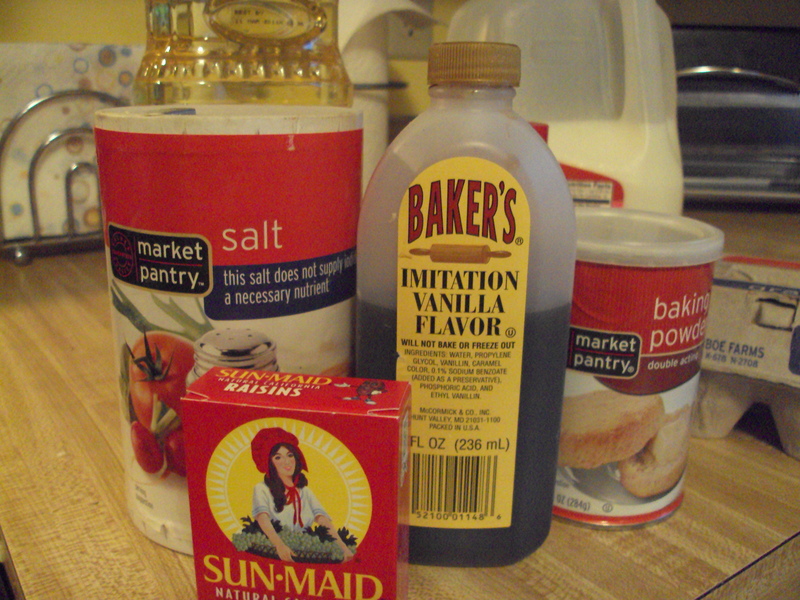 In another large bowl combine the flour, baking powder, baking soda, cinnamon, and salt. Gently fold in the berries, making sure they are coated with flour. This helps to prevent the berries from sinking during baking. Add the wet ingredients to the dry ingredients and stir only until the ingredients are just combined. Do not over mix the batter or tough muffins will result. Divide the batter evenly among the 12 muffin cups. Place in the oven and bake until a toothpick inserted in the center of a muffin comes out clean, 20 to 25 minutes. If you like the strawberry banana flavor combination as much as I do, give these a try. They were very easy to make, and hit the spot! 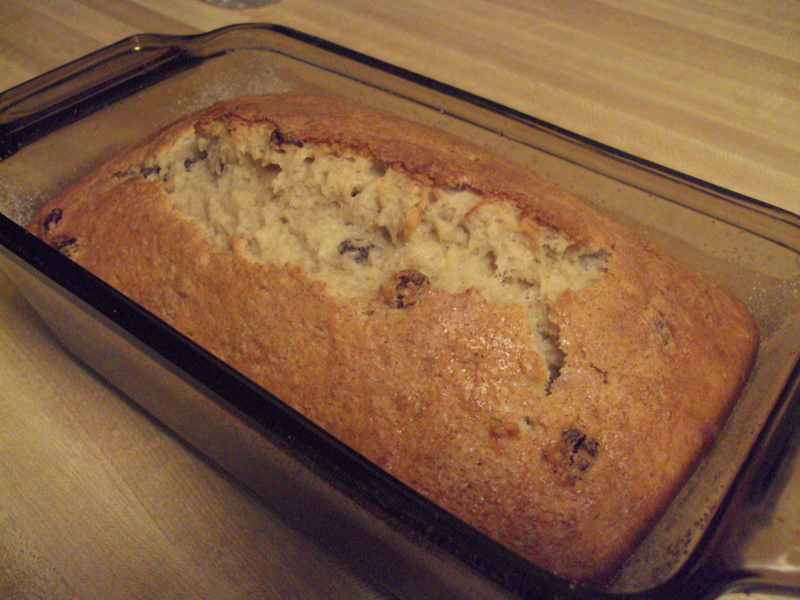 This week I found myself with a few over ripe bananas, so Scott requested banana bread. Regular banana bread was not very exciting, so I looked around a bit. Chocolate in banana bread sounded like fun, so I decided we’d give it a try. This recipe came out great, very moist and fluffy. Like a nice mix of chocolate cake and banana bread. We had it warm with a little butter right away, but it was just as good after it cooled just by itself. Preheat oven to 350 and place oven rack to middle position. Grease and flour the bottom and sides of a loaf pan. Set aside. In a large bowl combine the flour, sugar, baking powder, baking soda, salt. Set aside. In a medium-sized bowl combine the mashed bananas, eggs, melted butter, and vanilla. With a rubber spatula or wooden spoon, lightly fold the banana mixture into the dry ingredients just until combined and the batter is thick and chunky. Don’t over mix the batter, you do not want it smooth. Over mixing the batter will yield tough, rubbery bread. Place chocolate chips in a medium microwave-safe bowl, and microwave 1 minute or until almost melted, stirring until smooth. Cool slightly. Add 1 cup batter to chocolate, stirring until well combined. Spoon chocolate batter alternately with plain batter into loaf pan. Swirl batters together using a knife. Bake until bread is golden brown and a toothpick inserted in the center comes out clean, about 55 to 60 minutes. Place on a wire rack to cool and then remove the bread from the pan. I dropped off a chunk with my mom last night, she’s always complaining that she doesn’t get to eat the things I’m blogging about. She has somehow managed to keep my choco-holic stepdad from trying it, and it’s a good thing, or there’d be none left! I’ve had a few bananas on my counter for about a week now, and of course they’re turning browner every day. 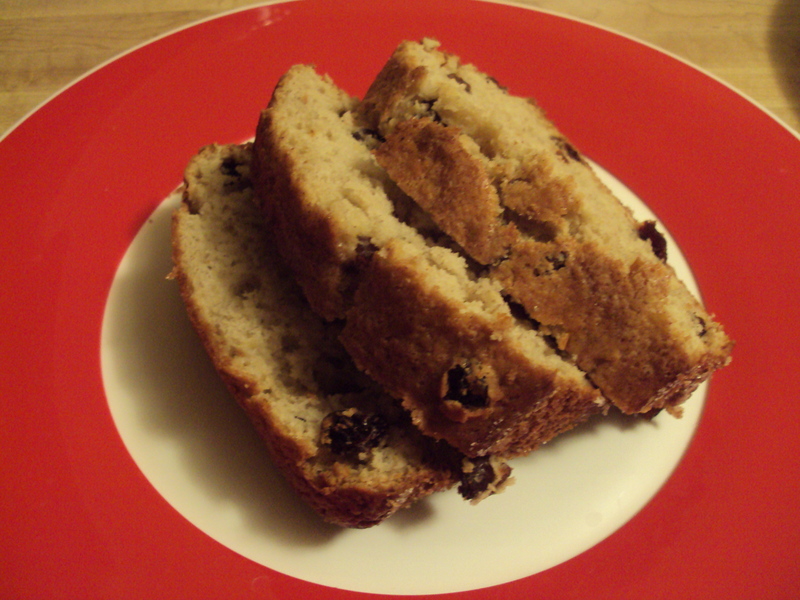 Last night I decided Banana Bread was in order. I found this recipe on allrecipes, but it called for nuts. I’ve never really cared for nuts in my food, so I left those out. The peanut butter is not very noticeable in the bread, but does give it a mild nutty flavor without the actual chunks of nuts. Preheat oven to 325. 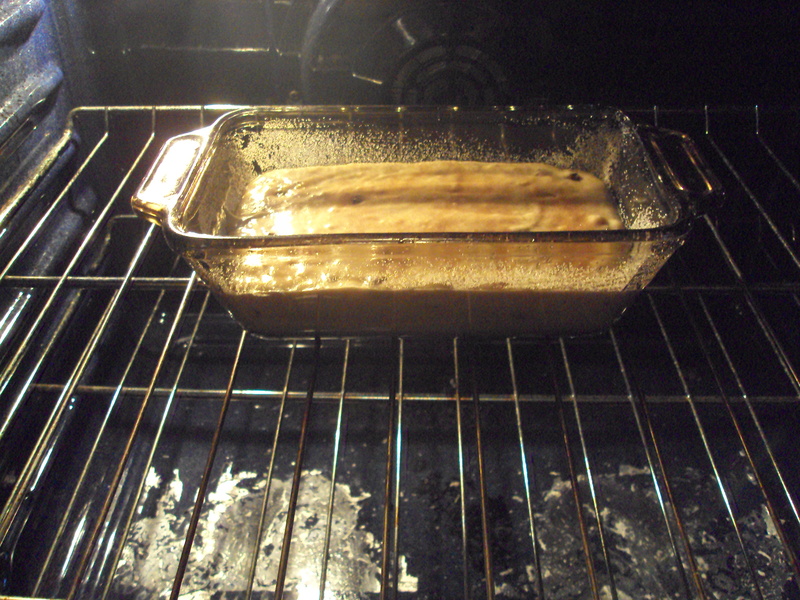 Lightly grease a 5×9 inch loaf pan. In a large mixing bowl, cream together butter and sugar. Add eggs; beat well. Stir in peanut butter, bananas, flour and baking soda until blended. Pour into prepared pan. Bake at 325 for 70 minutes, or until a toothpick inserted into center of the loaf comes out clean. Remove to a wire rack to cool.